Hiroshima Prefecture (広島県, Hiroshima-ken) is a Japanese prefecture in the Chūgoku region of the island of Honshu. The capital city is Hiroshima. 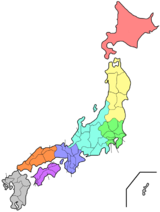 The area of Bingo Province and Aki Province were merged in Hiroshima Prefecture. Hiroshima is a traditional center of the Chūgoku region and was the seat of the Mōri clan until the Battle of Sekigahara. Hiroshima faces Shikoku across the Seto Inland Sea. Hiroshima Bay opens on the Inland Sea. The prefecture also includes many small islands. Yamaguchi Prefecture is to the south and west of the prefecture Shimane Prefecture is to the northwest. East of Hiroshima is Okayama Prefecture. National Parks are established in about 4% of the total land area of the prefecture. Itsukushima jinja is the chief Shinto shrine (ichinomiya) in the prefecture. ↑ Nussbaum, Louis-Frédéric. (2005). "Hiroshima-ken" in Japan Encyclopedia, p. 320; "Chūgoku" at pp. 127. ↑ Nussbaum, "Hiroshima" at pp. 319-320. ↑ Nussbaum, "Hiroshima Wan" at p. 320. This page was last changed on 31 August 2017, at 03:20.